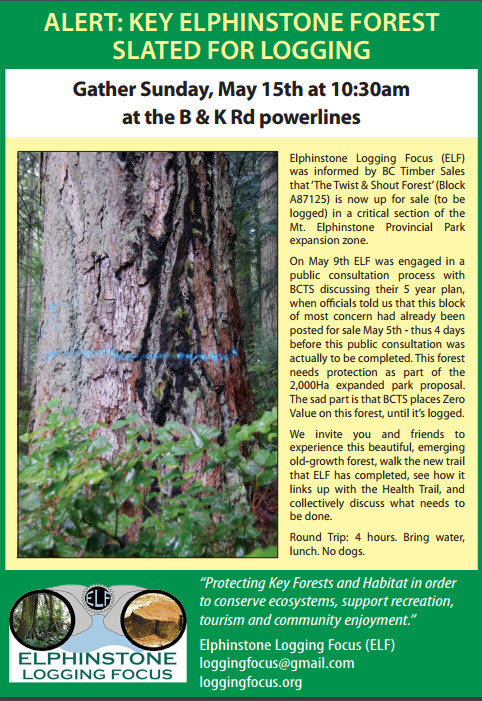 Elphinstone Logging Focus was informed by BC Timber Sales (BCTS) that ‘The Twist & Shout Forest’ (Block A87125) is now up for sale (to be logged) in a critical central area of the 2100 Ha Mt. Elphinstone Provincial Park expansion area. The park expansion area was made part of Roberts Creek Official Community Plan with the intent of preserving it for the future of our communities and nature. Additionally, Chief Craigan of the Sechelt Indian Band, has also stated he wants the area protected from industrial development. Biologist Wayne McCrory recently completed a Conservation Review of the park expansion area, and made a well argued recommendation for full protection. BCTS is not listening to any of us. On May 9th ELF was engaged in the public consultation process with BCTS discussing their 5 year plan, when officials told us that this block of most concern had already been posted for sale May 5th – 4 days before this public consultation was to be completed! That makes their public process meaningless. BCTS places zero value on this forest, until it’s logged. We invite you and friends to experience this beautiful, emerging old-growth forest, walk the new trail that ELF has completed, see how it links up with the Health Trail, and collectively discuss what needs to be done. Hike Round Trip: 4 hours. Bring water, lunch. No dogs. 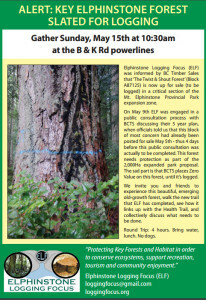 If you can’t make it out for this event, and want to influence a decision-maker, then contact BCTS Timber Sales Manager Mr. Kerry Grozier at: kerry.grozier@gov.bc.ca and request that under his authority he create a win-win situation by moving Cutblock A87125 outside of the Mt. Elphinstone Provincial Park expansion area.